On August 18th 1991, Oasis played their first gig at the Boardwalk in Manchester supporting Sweet Jesus. The video below is from August 18th 1994, when Liam & Noel Gallagher and Bonehead appeared on 'MTV Most Wanted' in Camden, London. 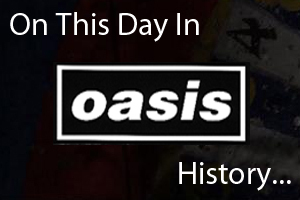 Also on August 18th 1994 Oasis played at the Astoria in London, watch the gig below.